Above photo: By Lori Panico in Indianz. We demand banks stop financing repression of Indigenous rights, human rights abuses, and desecration of the earth. On October 23rd, ninety-two of the world’s largest banks will meet in São Paolo, Brazil to discuss policies on the climate and Indigenous People’s rights to Free, Prior, and Informed Consent (FPIC). These banks include Dakota Access Pipeline (DAPL) financiers such as Wells Fargo, Bank of America, J.P. Morgan Chase, and many more. Mazaska Talks is calling on indigenous people and allies everywhere to join us for 3 days of mass global action that make it clear to the banks: Financing climate disaster and the abuse of Indigenous Peoples will result in a massive global divestment movement. On October 23rd, ninety-two of the world’s largest banks are meeting in São Paolo, Brazil to discuss environmental and social risk management policies regarding the climate and Indigenous People’s rights to Free, Prior, and Informed Consent (FPIC). We are writing today to inform you that we are boycotting your bank. We are taking this action as a result of your financing of new tar sands pipelines ― including Kinder-Morgan’s Trans-Mountain; Trans-Canada’s Keystone XL; and Enbridge’s Line 3. 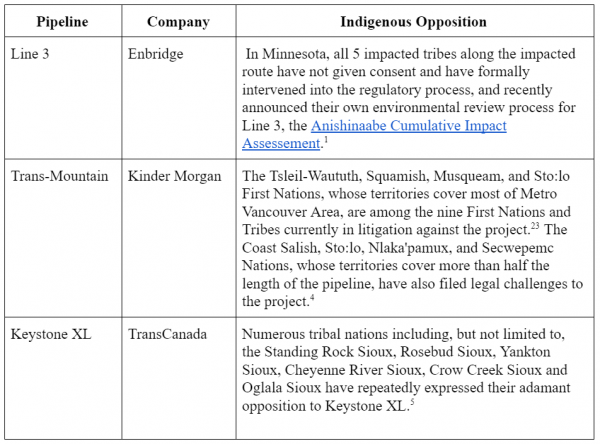 As with the Dakota Access Pipeline, these pipelines lack Free, Prior, and Informed Consent from all of the impacted indigenous nations [See chart on Page 3], an indigenous right upheld by the United Nations Declaration on the Rights of Indigenous People. Over 150 First Nations that are party to the Treaty Alliance Against Tar Sands Expansion oppose tar sands mining at the source and throughout the pipeline route. We implore your bank to prohibit all financing for all companies with tar sands operations, as well as all finance for tar sands projects, with public reporting on implementation. Furthermore ― given that tar sands is the most greenhouse-gas-intensive of fossil fuels ― the construction of these pipelines is entirely incompatible with achieving the goal of curtailing catastrophic climate change, as agreed to by 194 nations in Paris in 2015. As such, not only shall we be boycotting your bank, but we shall also be encouraging individuals, institutions and cities around the world to move towards banks that place people and the Earth before profits. Michelle Fournier, Organizer, 350 Maine. Dr. Bruce Amundson, MD, President, Washington Physicians for Social Responsibility.